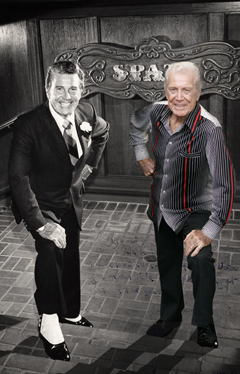 Guido Salmaggi looks just as dapper today, at 90, as he did 30 years ago when he held the role of "the boss and godfather" of Spats at Hyatt Regency Waikiki. 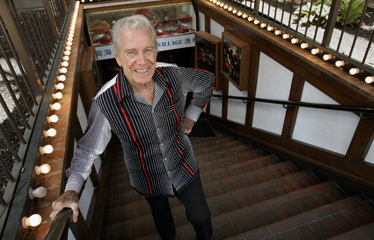 Thirty years ago, Guido Salmaggi was known in Waikiki as "Mr. Spats," the boss and godfather of the (fictional) crime family that ran Spats, an Italian restaurant/disco in the Hyatt Regency Waikiki. The menu was hearty old-style Italian cooking, the disco was one of cutting edge of the club scene, and Salmaggi and his "gang" gave the place the ambiance of a Prohibition era "speakeasy." Salmaggi could be found most nights wearing a sharp pinstripe suit similar to those worn by well-dressed gangsters in the Roaring '20s, with a boutonniere on his lapel and the spats on his shoes providing the final touch. His "family" included Ivan "Violin Case" Philpott, Craig "The Mortician" Deck and Ricky "The Rooster" Davis, and they accompanied him, violin cases at the ready, when he represented Spats in parades, at polo games, and other public events. Today, at 90, Salmaggi would still be convincing as "the boss" of Spats, but the club closed years ago. Returning, you might say, to "the scene of the crime," he looks as fit and trim as ever. The opportunity to portray a mob boss in Waikiki was only one of several unexpected twists in the life of a man who expected a career in opera. Salmaggi was drafted after the Japanese attack on Pearl Harbor in 1941 and first came to Hawaii in uniform. He returned to Hawaii in 1963 and subsequently served as Italian consul and as the Director of Auditoriums for the City & County of Honolulu. 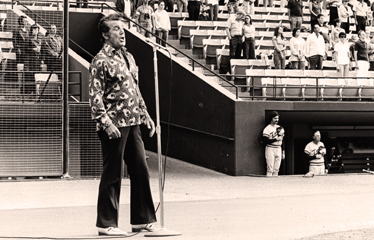 He also became known as "The 'The Star-Spangled Banner' guy," whose powerful rendition of the national anthem opened Hawaii Islanders baseball games and other sporting events at the old Honolulu Stadium. "I've had a lot of fun in Hawaii. I love the place, I love the people. They've all been very good to me and now I'm back to stay." 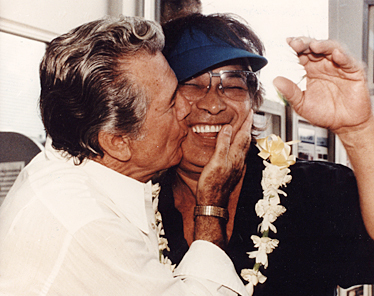 Guido Salmaggi, once known as "The Star-Spangled Banner" guy, busses Don Ho in 1992. Standing in the stairwell that was once the semisecret rear entrance to Spats at the Hyatt Regency Waikiki, Guido Salmaggi, who was 90 on his last birthday, makes 90 look like the new 70 -- in other words, we should all be so lucky! Asked whether he parked his car or left it with the valets, Salmaggi said that he had walked over from his Waikiki condo, and politely declined the offer of a ride back. "A lot of people don't believe I'm 90 when they see me. I'm very fortunate, and happy to say I'm in good shape," Salmaggi responds when we say that he doesn't "look 90" (whatever "90" is supposed to look like). Anyone would be happy to be 90 years old if they looked as good. And so, although life hasn't turned out the way he expected it would, Salmaggi isn't complaining. "I've had a beautiful past. It's been a good life," he says. "This is my home now, and I'm home to stay." Disappointments? Sure, he's had a few. Salmaggi was off to a promising start as an opera singer when his career was derailed by World War II. Rough spots? Yes, he's had some of those, too. For instance, Salmaggi had a seemingly secure and risk-free position as Director of Auditoriums of the City & County of Honolulu until then-Mayor Frank Fasi assigned him a deputy director that he couldn't work with. Salmaggi saw it as a gambit. "(Fasi) didn't like some of the things I was doing, and he got wind that I wanted to run for mayor, or something like that. He had an assistant ... so he gave him to me as my deputy director, and everything I said, (the assistant) was against." Salmaggi says that he finally told Fasi that he couldn't work with the man, and that one of them had to go. Turned out that one would be Salmaggi. Recalling the good old days: Guido Salmaggi poses in the stairwell leading down to where Spats nightclub was once located. Unemployed and with no immediate job prospects, Salmaggi considered selling his Kahala home and moving back to New York. Then came a call from Chris Hemmeter, who asked him to become the "boss" of Spats, the Italian restaurant/disco Hemmeter was opening in the Hyatt Regency Hotel. "I said 'Jeez, I don't know anything about nightclubs, and especially discotheques,' but he said he wanted me to dress as the boss of the enterprise and greet the people and so on. I said, 'It's a paying job, I hope,' and it was. It paid pretty well." "I got between $15- and $20,000 a year just for looking good, and those days that was pretty good money." Salmaggi moved to Sarasota, Fla., after Spats closed, but returned to Hawaii each summer to sing "The Star-Spangled Banner" at the Hyatt Regency Waikiki, the Outrigger Canoe Club, and Pearl Harbor. Now he's "home" for good. He says "now that I'm 39" and officially retired, he may occasionally sing the national anthem or an occasional "Ave Maria" in church. Other than that, "I'm taking it easy and enjoying the beautiful weather of Hawaii together with my wife, Maria." Salmaggi stays in shape by walking, and says that he "does most of the shopping." He also swims, enjoys doing other "athletic things" at the Outrigger Canoe Club, and has "cut back a little bit" on food. Salmaggi was famous locally for singing the national anthem many a time at the old Honolulu Stadium. A PARALLEL MIGHT be drawn with the career of another talented Italian, Tony Bennett, who has acquired a new youthful fan base in recent years. As "Mr. Spats" (or "Don Guido"), Salmaggi acquired a similar cachet of "cool" in the Honolulu club scene among people too young to remember him as a city employee, let alone as a booking agent or opera singer. Many assumed that he was drawing on personal experience in portraying "Don Guido" at Spats. Salmaggi says that all he knew about the mob when he was growing up was what he read in the newspaper. "We were well protected (by our parents)," he says of his childhood. Salmaggi was one of nine children. His father was a promoter -- "impresario" was the term used in those days -- who presented operas nationwide. As luck would have it, Salmaggi had the talent to sing opera professionally. "I made my opera debut in the lead role of 'La Traviata' in New York City at the New York Hippodrome in 1938. I was one of the youngest opera singers to make a professional opera debut, and I got very good write-ups in all the major newspapers in New York." Salmaggi had planned to go to Italy to continue his studies, but World War II intervened. Salmaggi was drafted and told he'd be out and back on stage in a year. The Army recognized talent and issued him a microphone instead of a rifle. Salmaggi's unit performed throughout the Pacific Theater, more than 1,000 shows in all. He says he has many fond memories of his war years and the people he worked with -- Maurice Evans, Carl Reiner, Alan Ludden and Hal David, to name a few. As far as his career , however, he counts himself as a "war casualty." 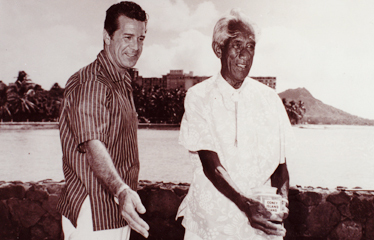 In his heyday, Guido Salmaggi, pictured with Duke Kahanamoku, walked among Hawaiian "royalty." "I was disappointed when they drafted me because I knew that it would spoil my life as a opera singer, (and) they kept me away for five years. When I came back (after the war) I sang professionally, but I had to start all over again, so I went into radio. I was singing with Radio Hall City Music Hall for two years as a soloist, but as far as opera goes, I just had to give it up. "It happened to many boys in their profession, so I'm not complaining. If I had to do it over again I'd be very happy to do it." Years later, Salmaggi forged a different bond with his ancestral homeland when he was appointed Italian consul in Hawaii in 1967. Salmaggi was recommended for the diplomatic post when the previous consul died. There were interviews and numerous letters of recommendation; Salmaggi recalls telling a panel of Italian diplomats in San Francisco that he was honored to be considered for the post of consul, and that he was proud of his Italian heritage, but that he would always think of himself first as an American and then as an Italian. "They applauded," he says, and in due time he got the job. Salmaggi represented Italy here for 20 years and resigned when he was informed that Italian law required government employees to retire when they reached 70. That was the end of his career as a foreign diplomat, although he counts being knighted, and receiving a title and a medal of honor, among the mementos of his years of service. But despite all of his honors and other mementos -- a signed commendation from Adm. Nimitz, countless photographs and newspaper clippings among them -- Salmaggi says a comment from his brother keeps him from taking any of his accomplishments too seriously. "He'd tell me, 'Guido, that's all beautiful, but that and $2 gets you on the bus!' "